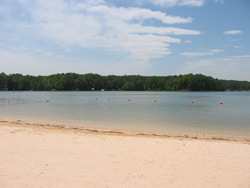 The park is located 5120 Allatoona Drive, Acworth. This is just north (across the lake) from Proctor Landing Park. This day use park's main attraction is its large swimming beach. This year you can also find "the world's largest inflatable water slide." It is 36 feet high and 175 feet long. The slides hours and an fee listing for use of the slide can be found at http://www.acworthslide.com. Dallas Park also has picnic tables with grilles, a volleyball court and a horse shoe pit available. If you want to have a large party in the park, there is a group pavilion availabe for rent. The park charges a $5 entry fee during the time of the year it is open, which is from the middle of April to the middle of September. Dallas Landing is managed by the city of Acworth. 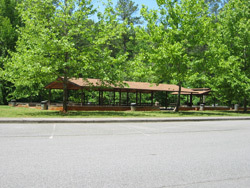 They can be reached at 770-917-1234 if you have any questions about the park or wish to reserve the picnic pavilion. The photo on the left shows a view of the swimming beach. The picnic pavilion on the left is available, for a fee, for group use.